Figure 1. Sintered test slugs are used to measure wick properties. 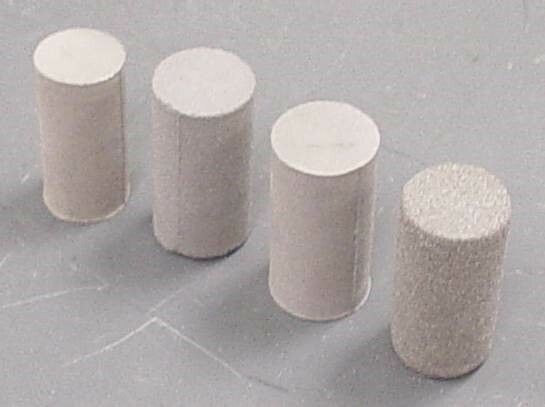 The properties of sintered wicks are normally measured on cylindrical samples; see Figure 1. Where ρSolidSlug is the density of the sintered material (i.e., copper). 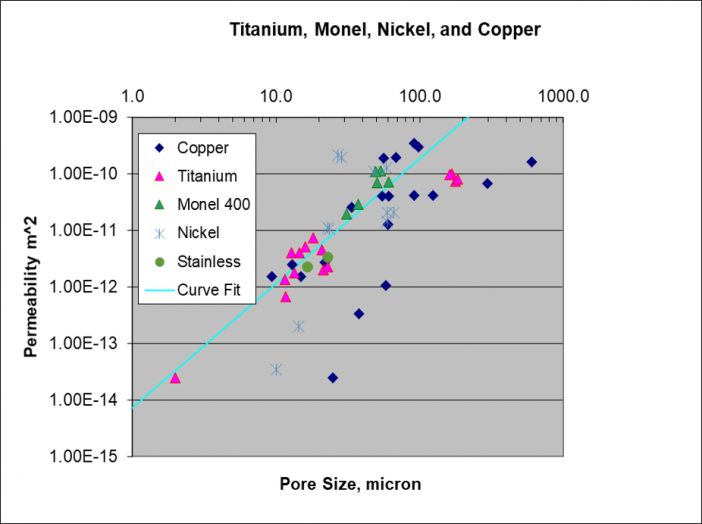 The porosity is then calculated by comparing the measured weight with the calculated slug solid weight. 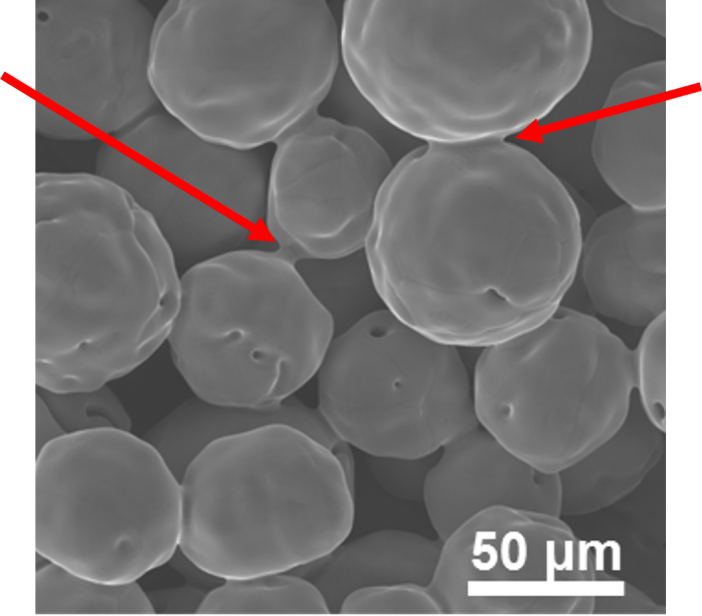 The typical porosity for a sintered wick is around 45%. Some wicks fabricated from filamentous powder can have porosities as high as 70%. Figure 2. SEM photo of sintered copper powder. The two arrows show examples of the bridges forming between the spherical particles. To measure the thermal conductivity, a sintered slug is heated on one side, and cooled on the other. 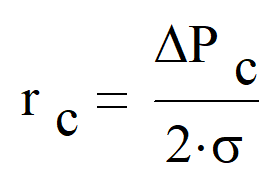 The temperature drop and heat flow can be used to calculated the thermal conductivity. To find the pore radius, the test slug is saturated with a liquid of known pore radius, with a small amount of liquid on top of the slug. The air pressure below the slug is continuously increased until the first air bubble appears on the top of the slug. This bubble point pressure across the slug, and the surface tension can then be used to calculate the largest pore radius in the wick sample. 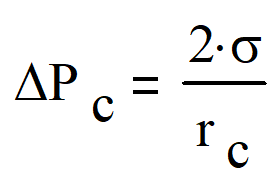 kWick Wick permeability, an intrinsic property of the wick, m2. Figure 3. 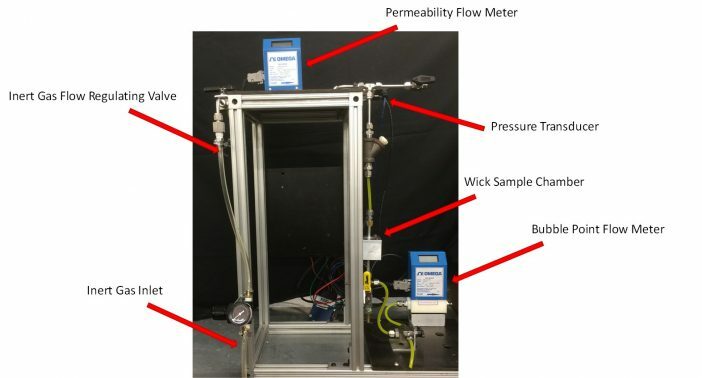 Test apparatus to measure wick pore size and permeability. The ideal heat pipe wick would have a small pore size (to maximize the capillary pumping capability), and a high permeability (to minimize the liquid pressure drop). Unfortunately, these two properties are mutually exclusive. As the pore size decreases, the permeability also decreases much more quickly. The wick selected for any given heat pipe is a tradeoff between pore size and permeability. with the permeability K in m2, and the pore size rc in m. It holds for sintered and screen wicks between 1 micron Loop Heat Pipe wicks and very coarse sintered or screen wicks. Figure 4. Anderson curve relating pore size and permeability.